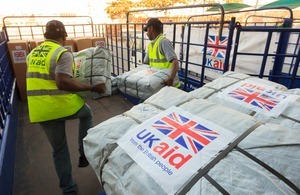 New British support will provide medical aid, temporary shelter and help with rebuilding homes damaged by the recent violence in Gaza. International Development Minister Alan Duncan announced new UK medical aid and shelter for thousands affected by the conflict in Gaza. New British support will provide medical aid, temporary shelter and help with rebuilding damaged homes for around 85,000 people affected by the recent violence in Gaza, International Development Minister Alan Duncan announced today. Mr Duncan promised £1.25 million in new support as he became the first British minister to visit Gaza since the ceasefire entered into force on 21 November. “Ordinary people in Gaza and in Israel have had their lives turned upside down by the recent conflict. We were deeply saddened by the lives lost on both sides. While the violence continued, existing UK funding helped trusted partners such as UNRWA and the World Food Programme provide health and education services and distribute food in the face of incredibly challenging conditions. This new funding will help meet the most immediate needs of those injured, made homeless or otherwise affected by the conflict. make emergency repairs to the Gaza water authority’s bomb-damaged infrastructure.